a. Runs more than 3 feet away from a direct line between bases to avoid being tagged or to hinder a fielder while the runner is advancing or returning to a base. When a play is being made on a runner or batter-runner, he establishes his baseline as directly between his position and the base toward which he is moving. A runner may slide in a direction away from the fielder to aviod making contact or altering the play of the fielder. PENALTY: The runner is out. Interference is called and the ball is dead immediately. On a force play slide with less than 2 outs, the runner is declared out, as well as the batter- runner. Runners shall return to the bases occupied at the time of the pitch. With 2 outs, the runner is declared out. The batter is credited with a fielder's choice. A play in which the defense has an opportunity to gain a favorable ruling from an umpire by addressing a mistake by the offense or seeking the input of another umpire. Appeals require the defense to literally make an appeal to an appropriate umpire. He will not announce, for example, runners failing to touch a base, batting out of order, or unchecked swings until an appeal is made. A ball that bounces in front of an infielder in an unexpected way, often as a result of imperfections in the field or the spin on the ball. A rectangle on either side of home plate in which the batter must be standing for fair play to resume. A foot and a hand out of the box are not sufficient to stop play (although pitchers will usually respect a batter's wish to step out of the box). The umpire must grant the batter a timeout before play is stopped. An umpire, referring to the typical dark blue color of the umpire's uniform. Sometimes used derisively in professional baseball, such as when complaining about a call, e.g. : "Oh, come on, Blue!" Any pitch that markedly deviates from a "straight" or expected path due to a spin used by the pitcher to achieve the desired effect. Some examples are the curveball, the slider and the screwball. c. a coach physically assist a runner during playing action. 2. It is umpire interference when he inadvertently moves so as to hinder the catchers attempt to throw, or when a fair ball an umpire as in 5-1-11, or a thrown ball as in 5-1-1g. 3. 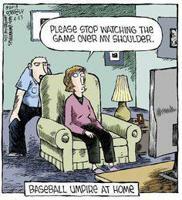 Spectator interference is an act by a spectator which impedes the progress of the game.